Run as Service start an application hidden in the background. Run application as service after the system boot, before a user is logged in, under system account with the highest privileges. Helping to run background jobs like monitoring tasks, copy jobs or check routines on a computer. Usable if application must be running with highest privileges and no user action is required. Because application run as service hidden in the background, it must be a program which work and finalize its task without any user input. RunAsService from RunAsRob is a small tool to run a program or a script like a batch file as windows service. The method is easy to understand. 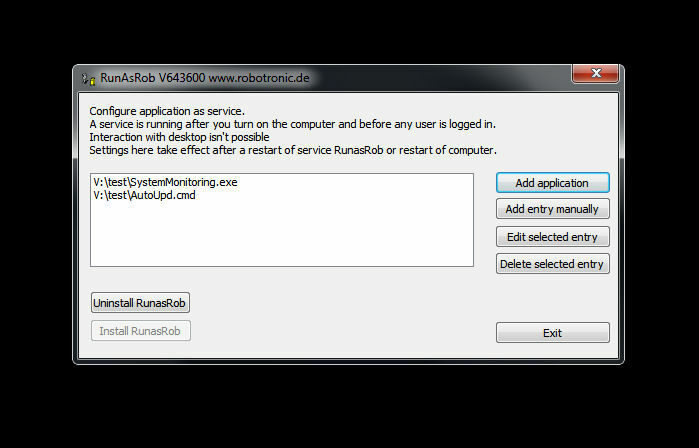 After you install the service of RunAsRob via the graphical user interface RunAsService.exe, you can add the application or script you want to run under service in windows. At the next boot of the computer, the service of RunAsRob start and read in its registry path the applications, which are set by the GUI RunAsService to start as service and launch each application under service with system account. Start RunAsService.exe as a local administrator. Press button >> Install RunAsRob <<. Select application you want to run as service by >> Add application <<. After each restart of system, now the application is running as service with system privileges, whether a user is logged in or not.